Join the discussion on our forums! Come discuss Free From Amber over in our dedicated Free From Amber discussion topic. KFT only adds 2 new cards to the the Amber Pool: Obsidian Statue and The Lich King. 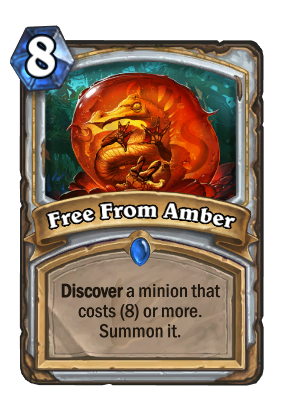 Both of these are very good picks, so Free From Amber got an indirect buff this expansion! Amazing in arena, i got three of them! Don't forget that if you get Blood of The Ancient One, you can use an unexpected Mirage Caller the next turn, or possibly this turn if you have Radiant Elemental on the board. In constructed, it's far too weak unless you have two Radiant Elementals on board. In arena, this card is usually a much better pick than other rares and can offer some incredible value. Not great, but it isn't that bad at all. I swear, Ultrasaur shows up with this more often than he does in packs! At least if my maths is correct anyway. If you rank The Boogeymonster as below par, I think Medivh, the Guardian so be ranked as below par too. Perhaps. My opinion was that Medivh, the Guardian was worse since without his battlecry he is just a flat 7/7. And whilst The Boogeymonster is only 6/7, he has the potential to grow on the board. As said, your opinions may differ. I didn't give it too much thought other than an initial quick review. Best use I've gotten from this so far is copying it with Mana Bind. Free 8+ drop? Yes please! It's great with Medivh, the Guardian's Atiesh. I happily await the Trolden clip where someone playing in Wild has 2 Summoning Stones and Atiesh on the board, then plays this to get 4 Ragnaros the Firelords! the chances of that is about 1 in 8026200 so I do not believe that that happened. Whoever decided this should be a rare clearly doesn't play Arena. Charged Devilsaur ... Its battlecry is not in effect so it can smorc. One of the best discoveries from this card. you have a 11.11% chance of discovering the exact minion you want and summoning it. so that goes for ysera, y'sharj, malygos, etc. Kazakus deathrattle reno will probably be better and this card would only have made it slower. Maybe in some fancy control priest but why would any1 play sth weaker. I'm crossing my fingers for the golden version of this on Wednesday.